For other uses, see Great Yarmouth (disambiguation). "The King and Our Rights"
The town has been a seaside resort since 1760, and was one of the great English seaside towns of the 19th century. It is the gateway from the Norfolk Broads to the North Sea. For hundreds of years it was a major fishing port, depending mainly on the herring fishery, but its fishing industry suffered a steep decline in the second half of the 20th century, and has now all but disappeared. The discovery of oil in the North Sea in the 1960s led to a flourishing oil rig supply industry, and today it services offshore natural gas rigs. More recently, the development of renewable energy sources, especially offshore wind power, has created further opportunities for support services. A wind farm of 30 generators is within sight of the town on the Scroby Sands. Great Yarmouth rose to prominence and as a major centre of tourism in England when a railway was built in 1844 making it much easier and cheaper for visitors to reach Yarmouth, triggering an influx of settlers. Wellington Pier was built in 1854, and Britannia Pier opened in 1858. Throughout the 20th century, Yarmouth continued to be a booming resort, with a promenade complete with piers, fortune-tellers, public houses, trams, donkey rides, fish-and-chip shops and theatres. In addition to its beach, Yarmouth's major attractions and landmarks include Britannia Pier, the Pleasure Beach, the Sea Life Centre, the Hippodrome Circus and the Time and Tide Museum, as well as the UK's only surviving Victorian seaside cast iron and glass Winter Garden. The town itself is on a 3.1-mile (5.0 km) spit sandwiched between the North Sea and River Yare. Its well-known features include the historic rows (narrow streets) and the main tourist sector on the seafront. The area is linked to Gorleston, Cobholm and Southtown by Haven Bridge and to the A47 and A149 by the Breydon Bridge. The urban area that makes up the town of Great Yarmouth has an area of 8.3 sq mi (21 km2) and according to the Office for National Statistics in 2002 had a population of 47,288. It is the main town in the larger Borough of Great Yarmouth. The ONS identify a Great Yarmouth Urban Area, which has a population of 68,317, including the sub-areas of Caister-on-Sea (8,756) and Great Yarmouth (58,032). 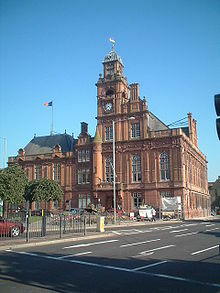 The wider borough of Great Yarmouth has a population of around 92,500, increasing to 97,277 at the 2011 census. Great Yarmouth was 92.8% White British, with the next biggest ethnic demographic being Other White, at 3.5%, which consists mainly of Eastern Europeans. Great Yarmouth (Gernemwa, Yernemuth) lies near the site of the Roman fort camp of Gariannonum at the mouth of the River Yare. 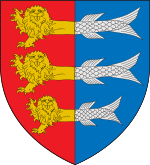 Its situation having attracted fishermen from the Cinque Ports, a permanent settlement was made, and the town numbered 70 burgesses before the Norman Conquest. Henry I placed it under the rule of a reeve. In 1101 the Church of St Nicholas was founded by Herbert de Losinga, the first Bishop of Norwich, and consecrated in 1119. This was to be the first of several priories founded in what was a wealthy trading centre of considerable importance. In 1208, King John granted a charter to Great Yarmouth. The charter gave his burgesses of Yarmouth general liberties according to the customs of Oxford, a gild merchant and weekly hustings, amplified by several later charters asserting the rights of the borough against Little Yarmouth and Gorleston. The town is bound to send to the sheriffs of Norwich every year one hundred herrings, baked in twenty four pasties, which the sheriffs are to deliver to the lord of the manor of East Carlton who is then to convey them to the King. The hospital was founded in Yarmouth in the reign of Edward I by Thomas Fastolfe, father of Thomas Fastolf, the Bishop of St David's.. In 1551, a grammar school founded and the great hall of the old hospital was appropriated to its use. The school was closed from 1757 to 1860, was re-established by the charity trustees, and settled in new buildings in 1872. The 133-foot-tall (41 m) Britannia Monument, built in 1817. Yarmouth is an antient town, much older than Norwich; and at present, tho' not standing on so much ground, yet better built; much more compleat; for number of inhabitants, not much inferior; and for wealth, trade, and advantage of its situation, infinitely superior to Norwich. It is plac'd on a peninsula between the River Yare and the sea; the two last lying parallel to one another, and the town in the middle: The river lies on the west-side of the town, and being grown very large and deep, by a conflux of all the rivers on this side the county, forms the haven; and the town facing to the west also, and open to the river, makes the finest key in England, if not in Europe, not inferior even to that of Marseilles itself. The ships ride here so close, and as it were, keeping up one another, with their head-fasts on shore, that for half a mile [800 m] together, they go cross the stream with their bolsprits over the land, their bowes, or heads, touching the very wharf; so that one may walk from ship to ship as on a floating bridge, all along by the shore-side: The key reaching from the drawbridge almost to the south-gate, is so spacious and wide, that in some places 'tis near one hundred yards from the houses to the wharf. In this pleasant and agreeable range of houses are some very magnificent buildings, and among the rest, the custom-house and town-hall, and some merchants houses, which look like little palaces, rather than the dwelling-houses of private men. The former Royal Naval Hospital, Great Yarmouth. In 1797, during the French Revolutionary Wars, the town was the main supply base for the North Sea Fleet. The fleet collected at the roadstead, from whence it sailed to the decisive Battle of Camperdown against the Dutch fleet. Again in 1807, during the Napoleonic Wars, the fleet collected at and sailed from the roadstead to the Battle of Copenhagen. From 1808 to 1814 the Admiralty in London could communicate with its ships in the port of Great Yarmouth by a shutter telegraph chain. Ships were routinely anchored off Yarmouth during the Napoleonic Wars, and the town served as a supply base for the Royal Navy. Part of an Ordnance Yard survives from this period on Southtown Road, probably designed by James Wyatt: a pair of roadside lodges (which originally housed the senior officers) frame the entrance to the site, which contains a sizeable Armoury of 1806, a small barracks block and other ancillary buildings. Originally the depot extended down to a wharf on the River Yare and was flanked by a pair of Storehouses, but these and other buildings were destroyed in The Blitz. A grander survival is the former Royal Naval Hospital designed by William Pilkington, begun in 1806 and opened in 1811. Consisting of four colonnaded blocks around a courtyard, it served for a long time as a naval psychiatric hospital before being transferred to the NHS in 1958. After closure in 1993 the buildings were converted into private residences. The town was the site of a bridge disaster and drowning tragedy on 2 May 1845 when a suspension bridge crowded with children collapsed under the weight killing 79. They had gathered to watch a clown in a barrel being pulled by geese down the river. As he passed under the bridge the weight shifted, causing the chains on the south side to snap, tipping over the bridge deck. Great Yarmouth had an electric tramway system from 1902 to 1933. From the 1880s until the First World War, the town was one of the regular destinations for the Bass Excursions, when fifteen trains would take 8-9000 employees of Bass's Burton brewery on an annual trip to the seaside. During World War I Great Yarmouth suffered the first aerial bombardment in the UK, by Zeppelin L3 on 19 January 1915. That same year on 15 August, Ernest Martin Jehan became the first and only man to sink a steel submarine with a sail rigged Q-ship, this off the coast of Great Yarmouth. It was also bombarded by the German Navy on 24 April 1916. The town suffered Luftwaffe bombing during World War II as it was the last significant place German bombers could drop bombs before returning home, but much is left of the old town including the original 2000m protective mediaeval wall, of which two-thirds has survived. Of the 18 towers, 11 are left. On the South Quay is a 17th-century Merchant's House, as well as Tudor, Georgian and Victorian buildings. Behind South Quay is a maze of alleys and lanes known as "The Rows". Originally there were 145. Despite war damage, several have remained. The southern section of the two-mile (3 km) A47 Great Yarmouth Western Bypass opened in May 1985, with the northern section opened in March 1986. The Bypass was later relabelled as part of the A12, until it was returned to being part of the A47 in February 2017. The town was badly affected by the North Sea flood of 1953. More recent flooding has been a problem, the town flooding four times in 2006. In September 2006 the town suffered its worst flooding in years. Torrential rain caused drains to block as well as an Anglian Water pumping station to break down and this resulted in flash flooding around the town in which 90 properties were flooded up to 5 ft.
Panorama of Hall Quay seen from Southtown. This shows the Town Hall and Star Hotel. Historic South Quay continues to the right of the image. The Tollhouse, with dungeons, dates from the late 13th century and is one of the oldest gaols, and oldest civic buildings in Britain. It backs on to the central library. Great Yarmouth Minster (The Minster Church of St Nicholas, founded in the 12th century as an act of penance) situated just off the market place, on Church Plain is the largest parish church in England. Neighbouring Church Plain is also the 17th-century timberframe house in which Anna Sewell (1820–1878), famous as the author of Black Beauty, was born. Significant sections of the mediaeval town walls survive around the parish cemetery and parts of the old town. The market place is one of the largest in England, and has been operating since the 13th century. It is also home to the town's shopping sector and the famous Yarmouth chip stalls. As well as leading to historic alleyways The Rows. The smaller area south of the market is used as a performance area for community events and for access to the town's shopping centre, Market Gates. Great Yarmouth railway station, which serves the town, is the terminus of the Wherry Lines from Norwich. Before the Beeching Axe the town had a number of railway stations and a direct link to London down the east coast. The only remaining signs of these stations is the coach park where Beach Station once was and the A12 relief road which follows the route of the railway down into the embankment from Breydon Bridge. Yarmouth has two piers, Britannia Pier (which is Grade II listed)) and Wellington Pier. The theatre building on the latter of the two was demolished in 2005 and reopened in 2008 as a family entertainment centre including a ten pin bowling alley with floor to ceiling windows overlooking the beach. Britannia Pier is home to the Britannia Theatre which during the summer months features well-known acts including; Jim Davidson, Jethro, Basil Brush, Cannon and Ball, Chubby Brown, Chuckle Brothers and The Searchers. The theatre is one of only a few end-of-the pier theatres surviving in England. From the seafront the windfarm of Scroby Sands with its giant windmills can be seen, as well as grey seals during their breeding season. The country's only full-time circus, The Hippodrome, is just off the seafront and puts on regular shows. The Grade II listed Winter Gardens building sits next to the Wellington Pier. The cast iron framed glass structure was shipped by barge from Torquay in 1903. It is said this was done without the loss of a single pane of glass. Over the years, it has been used as ballroom, roller skating rink and beer garden. In the 1990s it was converted into a nightclub by Jim Davidson and has since been used as a family leisure venue. It is currently closed. It has been named by the Victorian Society as a heritage building at risk of disrepair. Great Yarmouth's seafront, known as "The Golden Mile" attracts millions of visitors each year to its sandy beaches, indoor and outdoor attractions and amusement arcades. 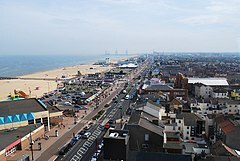 Great Yarmouth's Marine Parade has twelve Amusement Arcades within 2 square miles (5.2 km2), including: Atlantis, The Flamingo, Circus Circus, The Golden Nugget, The Mint, Leisureland, The Majestic, The Silver Slipper, The Showboat, Magic City, Quicksilver and The Gold Rush, opened in 2007. In addition to the two piers, tourist attractions on Marine Parade include Joyland, Pirates Cove Adventure Golf, Yesterday's World, the Marina Centre, retroskate, Arnold Palmer Putting Green, the Sea Life Centre, Merrivale Model Village and the Pleasure Beach and Gardens. The South Denes area is home to the Grade I listed Norfolk Naval Pillar, known locally as the Britannia Monument or Nelson's Monument. This tribute to Nelson was completed in 1819, 24 years before the completion of Nelson's Column in London. The monument, designed by William Wilkins, shows Britannia standing atop a globe holding an olive branch in her right hand and a trident in her left. There is a popular assumption in the town that the statue of Britannia was supposed to face out to sea but now faces inland due to a mistake during construction, although it is thought she is meant to face Nelson's birthplace at Burnham Thorpe. The monument was originally planned to mark Nelson's victory at the Battle of the Nile, but fund-raising was not completed until after his death and it was instead dedicated to England's greatest naval hero. It is currently surrounded by an industrial estate but plans are in place for the improvement of the area. The Norfolk Nelson Museum on South Quay houses the Ben Burgess collection of Nelson memorabilia and is the only dedicated Nelson museum in Britain other than that in Monmouth. Its several galleries look at Nelson's life and personality as well as what life was like for the men who sailed under him. Charles Dickens used Yarmouth as a key location in his novel David Copperfield and described the town as "the finest place in the universe". The author stayed at the Royal Hotel on the Marine parade while writing David Copperfield. The Time and Tide Museum on Blackfriars Road which is managed by Norfolk Museums Service was nominated in the UK Museums Awards in 2005. It was built as part of the regeneration of the south of the town in 2003. Its location in an old herring smokery harks back to the town's status as a major fishing port. Sections of the historic town wall are opposite the museum next to the Great Yarmouth Potteries, part of which is housed in another former smoke house. The town wall is the second most complete Medieval town wall in the country, with eleven of the eighteen original turrets still standing. Other museums in the town include the National Trust's Elizabethan House, the Great Yarmouth Row Houses, managed by English Heritage, and the privately owned Blitz and Pieces based on the Home Front during WWII. The Maritime Heritage East partnership, based at the award-winning Time and Tide Museum aims to raise the profile of maritime heritage and museum collections. The Yarmouth area is home to a number of rare and unusual species. The area between the piers is home to one of the largest roosts of Mediterranean gulls in the UK. Breydon Water, just behind the town, is a major wader and waterfowl site, with winter roosts of over 100,000 birds. This and the surrounding Halvergate Marshes are environmentally protected, and the majority of the area is now managed by conservation organisations, principally the RSPB. The North Denes area of the beach is an SSSI due to its dune plants, and is home to numbers of skylarks and meadow pipits. It also hosts one of the largest little tern colonies in the UK each summer, as well as a small colony of grayling butterflies. Other butterflies found here include small copper and common blue. The nearby cemetery is renowned as a temporary roost for spring and autumn migrants. Redstart and pied flycatcher are often seen here during migration. It has also been the site for the first records of a number of rare insects, blown in from the continent. Grey seal and common seal are frequently seen off-shore, as are seabirds such as gannet, little auk, common scoter, razorbill and guillemot. The main local football club is Great Yarmouth Town, also known as the Bloaters, who play in the Eastern Counties League. Their ground is at Wellesley Recreation Ground, named after Sir Arthur Wellesley. They have a strong East Anglian rivalry with Gorleston. The club has enjoyed limited success in the past. Local football clubs are served by the Great Yarmouth and District League. Yarmouth has a horse-racing track which features a chute allowing races of one mile (1.6 km) on the straight. Speedway racing was staged in Great Yarmouth before and after the Second World War. The meetings were staged at the greyhound stadium in Caister Road. The post war team were known as the Yarmouth Bloaters (after the smoked fish). Banger and Stock car racing is also staged at this stadium. The main Leisure Centre is the Marina Centre. Built in 1981 the centre has a large swimming pool, conference facilities and live entertainment including their famous Summer Pantomimes and Summer Variety Shows produced by local entertainers Hanton & Dean. The centre is run by the Great Yarmouth Sport and leisure Trust. The Trust was set up in April 2006 to run the building as a charitable non-profit making organisation. At the beginning of the 2008 summer season a world's first Segway Grand Prix was opened at the Pleasure Beach gardens. The English Pool Association (EPA), the governing body for 8-Ball Pool in England, holds its National Finals Competitions (including Inter-County and Inter-League, singles and team competitions, and England trials) over several weekends through the year, at the Vauxhall Holiday Park on the outskirts of Great Yarmouth. Great Yarmouth is connected to Norwich by the Wherry Lines from Great Yarmouth railway station, it is served by an hourly service provided by Abellio Greater Anglia via Acle or, less frequently, via Reedham. It is the only remaining station of the three once in the town. The town was adversely affected by the Beeching cuts. There were previously four railway lines coming into the town; from the north the line came down the coast from Melton Constable into the terminus at Beach station. From the south-west came the line from London Liverpool Street via Beccles and from the south the line from Lowestoft Central via Hopton and Gorleston; both of which terminated at South Town station. The only existing terminal is Vauxhall station which is now simply referred to as 'Great Yarmouth station'. Whereas once the town had 17 stations within the borough limits it now only has one. The bus station in Great Yarmouth is the major hub for local routes beneath Market Gates Shopping Centre. The Excel X1 route operated by First Norfolk & Suffolk provides a long-distance link between Peterborough and Lowestoft via Norwich and King's Lynn. Other local bus services link the suburban areas of Martham, Hemsby, Gorleston, Bradwell and Belton/ These are mostly operated by First Norfolk & Suffolk and services to towns further afield such as Beccles, Southwold, Acle and Diss are mostly operated by Konectbus. Haven Bridge; one of the two main links to the town pictured in its upright position allowing boats to pass beneath. The River Yare cuts off Great Yarmouth from other areas of the borough such as Gorleston and Southtown and so the town's two bridges have become major transport links. Originally Haven Bridge had been the only link over the river but in the late 1980s Breydon Bridge was built to take the A12 over Breydon Water replacing the old railway bridge; the Breydon Viaduct. Both are lifting bridges, which can be raised to allow river traffic to pass through. This can result in traffic tailbacks, and the phrase "the bridge was up" has become synonymous in the town with being late for appointments. A ferry operated between the southerly tip of Great Yarmouth and Gorleston, and provided a way of getting between the factories on South Denes and the mostly residential areas of Gorleston without taking a long detour over the bridge. However, due to increased running costs and the decline of industrial activity in the town, it was closed in the early 1990s. Since 2006, the restored pleasure steamer the Southern Belle has provided regular river excursions from the town's Haven Bridge. Built in 1925 for the Earl of Mount Edgcumbe, she is today owned by the Great Yarmouth and Gorleston Steam Packet Company Limited. Construction work on the Great Yarmouth Outer Harbour, a deep-water harbour on the North Sea, began in June 2007 and was completed by 2009. Originally there were plans for a ro-ro ferry link with Ĳmuiden which has failed to materialise. A new initiative by Seamax Ferries to connect Great Yarmouth and IJmuiden by ferry is to start halfway 2018. Similarly, despite the installation of two large cranes in 2009, and since removed, plans for a container terminal have also been scrapped. There has been a lifeboat in Great Yarmouth since at least 1802. The early boats were privately operated until 1857 when the RNLI took over. It has a lifeboat station at Riverside Road, Gorleston (52°34′32″N 1°43′55″E﻿ / ﻿52.575419°N 1.732039°E﻿ / 52.575419; 1.732039) from where are operated the Trent class lifeboat Samarbeta and the B class (inshore) lifeboat Seahorse IV. The anchorage off Yarmouth, known as Yarmouth Roads, was considered one of East Coast's best anchorages in the early 1800s, and was the location where fleets gathered and set sail from during the Napoleonic wars. Nowadays the roadstead is more like to be referred to as an anchorage. The A12 terminates in the town as do the A143 and the A47 roads. The relief road was built along the path of the old railway to carry the A12 onwards to Lowestoft and London. Roundabouts, junctions and bridges often become gridlocked at rush hour. In 2017, the A12 between the town and Lowestoft was renumbered as the A47 by Highways England, this was part of a wider road improvement scheme for the town, therefore this led to the A12 then terminating in Lowestoft instead of at Vauxhall Roundabout and the A47 to continue through the town as well instead of ending. This now leaves the A143 and A149 as the only roads to terminate in Great Yarmouth. Plans have been put forward for the construction of a third river crossing in Great Yarmouth which would link northern Gorleston with the South Denes and the Outer Harbour avoiding the congested town centre. A public consultation took place in mid-2009 over the four possible proposals but by late 2010 the plans were stalled by a lack of funding and the closure of the container terminal. In 2016, additional funding of just over £1m was pledged  and a potential crossing proposal outlined which would see the crossing link from the A12 at the Harfrey's roundabout to South Denes. If final approval is given, construction could begin in 2021. The North Denes Heliport is north of the town and currently operated by CHC Helicopter. In 2011 the heliport was planned to be permanently closed with operations being moved to Norwich International Airport, yet this closure never occurred. There is an East of England Ambulance Service First Responder group set up to cover the Great Yarmouth area. A First Responder scheme is made up of a group of volunteers who within the community in which they live or work, have been trained to attend emergency 999 calls by the NHS Ambulance Service. Great Yarmouth and Lowestoft Enterprise Zone was launched in April 2012. Its sites include Beacon Park and South Denes in Great Yarmouth. Sir John Clere (c.1511-1557) politician  and naval commander. Sir John Potts, 1st Baronet (c.1592–1673) politician, sat in the House of Commons from 1640 / 1648 and in 1660. Rebecca Nurse (1621–92), sister of Mary Eastey and another victim of the Salem witch trials, was born in Great Yarmouth. Dr. Thomas Girdlestone (1758−1822), English physician  and writer. William Fisher (1780–1852) officer of the Royal Navy  and a novelist. Robert Gooch M.D. (1784–1830) physician. William Yarrell (1784–1856), ornothologist admired by his contemporaries for his precise scientific work. William Hovell (1786−1875), explorer of Australia  was born in Great Yarmouth. Henry Stebbing FRS (1799–1883) cleric, man of letters, poet, preacher, and historian. Robert McCormick (1800–1890) Royal Navy  ship's surgeon, explorer and naturalist. Sir Edmund Lacon (1807–1888) liberal Conservative politician  who sat in the House of Commons between 1852 and 1885. Sir James Paget (1814−99), Victorian surgeon  who had the James Paget Hospital named in his honour. Emma Maria Pearson (1828–1893) writer, one of the first British women nurses in the Red Cross. Sir G. A. H. Branson PC (1871-1951), barrister and High Court judge, grandfather of Richard Branson. Sir Kenneth MacMillan (1929–1992), choreographer  with the Royal Ballet, Covent Garden. Richard Larn OBE (born 1931) retired RN Chief Petty Officer, businessman and maritime historian. Peter Rodulfo (b. 1958) Artist, sculptor and leading member of the North Sea Magical Realists. Keith Chapman (b. 1959) British television writer and producer, best known as the creator of children's television programmes Bob the Builder and PAW Patrol. Jason Statham (born 1967), actor, lived in Great Yarmouth during his childhood and attended the local grammar school. Travis Kerschen (born 1982) independent  film actor. ^ "Great Yarmouth (Norfolk, East of England, United Kingdom) - Population Statistics, Charts, Map, Location, Weather and Web Information". www.citypopulation.de. ^ "Town's last fishing boat fights tide and time". The Daily Telegraph. 14 January 2008. ^ Encyclopedia of the World's Coastal Landforms. Springer Science & Business Media. p. 454. ISBN 978-1-402-08638-0. ^ "Great Yarmouth Authority population 2011". Retrieved 25 August 2015. ^ Services, Good Stuff IT. "Great Yarmouth - UK Census Data 2011". UK Census Data. Retrieved 2018-10-04. ^ Nuttall, P Austin (1840). A classical and archæological dictionary of the manners, customs, laws, institutions, arts, etc. of the celebrated nations of antiquity, and of the middle ages. London. p. 555. ^ "Fisherman's Hospital". greatyarmouthculturalheritage.co.uk. Great Yarmouth Cultural Heritage. Retrieved 17 February 2019. ^ Finch-Crisp, William (1877). Chronological Retrospect of the History of Great Yarmouth and Neighbourhood from A.D. 46 to 1884. Great Yarmouth: William Finch-Crisp. ^ "A Brief History of the Royal Naval Hospital, Great Yarmouth". ^ "The Fall of Yarmouth Road". AngliaCampus. Retrieved 11 October 2009. ^ "England | Norfolk | Homes under water in flash floods". BBC News. 25 September 2006. Retrieved 29 January 2010. ^ John Greaves Nall (1866). Great Yarmouth and Lowestoft: A Handbook for Visitors and Residents. Longmans, Green, Reader & Dyer. p. 257. ^ Clive Tully (1990). The Visitor's Guide to East Anglia. MPC. p. 69. ISBN 978-0-86190-356-6. ^ John Steane (30 October 2014). The Archaeology of Medieval England and Wales. Routledge. p. 25. ISBN 978-1-317-59994-4. ^ "Great Yarmouth Britannia Pier - National Piers Society". Archived from the original on 5 October 2013. Retrieved 4 October 2013. ^ "Victorian Society reveals top 10 buildings 'crying out' to be saved". BBC News. BBC. ^ Biddle, Sophie. "Everyone aboard at Great Yarmouth's Big Day Out". Great Yarmouth Mercury. ^ "English Pool Association - Home Page". Epa.org.uk. Retrieved 26 March 2013. ^ "Norfolk Caravan Camping Lodge Holidays and Short Breaks - Vauxhall Holiday Park in Great Yarmouth". Vauxhall-holiday-park.co.uk. Retrieved 26 March 2013. ^ National Express East Anglia Timetables. Retrieved 20 November 2010. ^ The Southern Belle Archived 21 November 2009 at the Wayback Machine. Retrieved 29 October 2009. ^ Stephen Pullinger (10 November 2010). "Great Yarmouth outer harbour's £7m cranes to go". Eastern Daily Press. Retrieved 20 November 2010. ^ "Great Yarmouth and Gorleston Fleet". RNLI. Archived from the original on 26 August 2007. Retrieved 29 January 2010. ^ "Parliamentary Papers". 4. H.M. Stationery Office. 1826: 116, 224. ^ "Anchorage of Great Yarmouth". MarineTraffic.com. Retrieved 9 March 2017. ^ ""Town's heliport to close next year"] East Coast Live; Retrieved 20 November 2010". Archived from the original on 1 August 2012. ^ "Great Yarmouth First Responders". Great Yarmouth First Responders. Archived from the original on 23 December 2010. Retrieved 22 June 2010. ^ Dickson, Annabelle (12 January 2012). "Great Yarmouth and Lowestoft enterprise zone interest from around the world". EDP24. Eastern Daily Press. Retrieved 13 March 2015. Wikivoyage has a travel guide for Great Yarmouth. Wikimedia Commons has media related to Great Yarmouth.